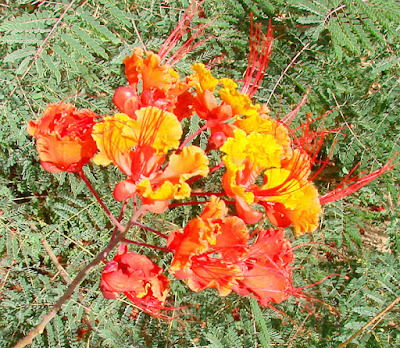 This is a flowering shrub that's used in front of many homes and along the streets in Palm Springs. 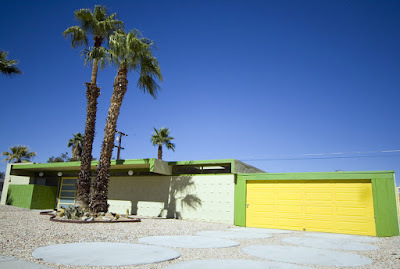 Sometimes Palm Springs' homes are painted in bright, primary colors. Got another shot at this great development. Another question to ask, when's the thing gonna start being built? 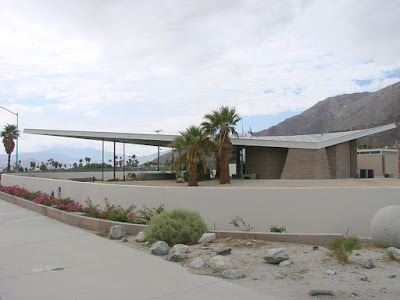 This is the famous Palm Springs Welcome Center designed by architect Albert Frey. 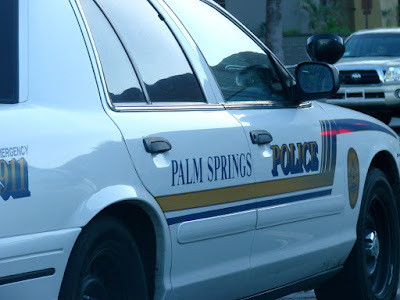 It's scalping season here in beautiful Palm Springs. See the tractor in the picture? It's why the grass is gone and the land is brown. It had just stopped, and before it did, it was spewing a giant ball of smoke. Ah Choo! It's been a concern of environmentalists, that scalping contributes heavily to fouling the air. They have a new way to do it that's less offensive than the way this tractor does--digging deep in the ground, pulling the old grass up and out. 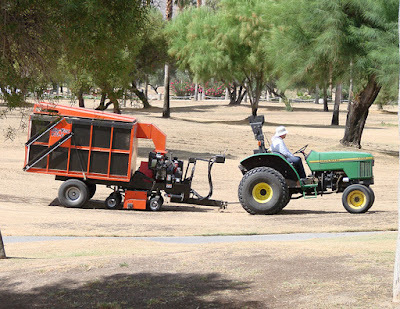 Most all of the public grass areas in Palm Springs are scalped, so that the gardeners can plant rye seeds, which grow into grass. Rye (yeah, the kind that's in rye bread) can take the colder temperatures that come at night here during the winter. 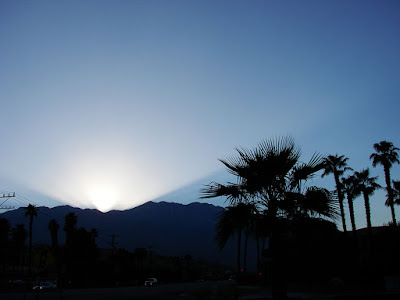 This was the way it looked last night just as the sun was ducking behind the mountain. This is our new convention center. The beautiful architecture stops right here, on a quiet street that's not easy to find. 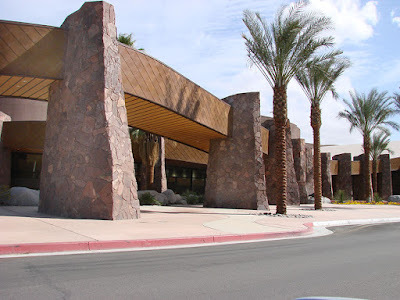 As you walk around the massive complex, it turns to bare walls without windows and ornamintation facing a busy street. 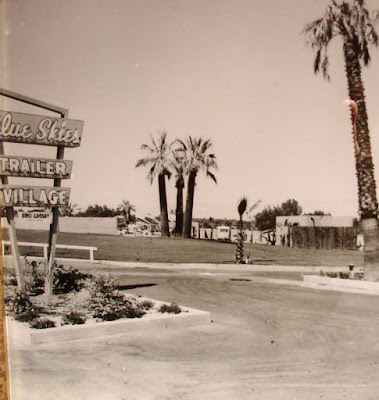 Yep, Palm Springs had trailers and it still does today. 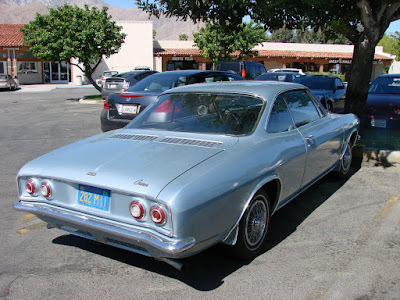 The Chevrolet Corvair was an automobile produced by the Chevrolet division of General Motors from 1960 to 1969. Its engine is in the back, not in the front. We get all kinds of old cars in this town. Okay, in the last post, thanks! 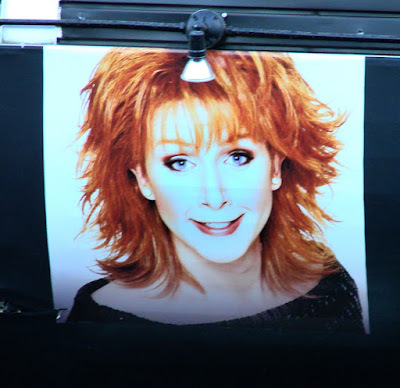 Now I know that's Reba! My question is what word first comes to mind when you see it? Let the legs strut down the stage at Copykatz nightclub in Palm Springs. The club is on the main drag (get it, drag club, main drag) of town. In this picture, please find Shirley MacLaine. Okay it doesn't look identical to her, but it's not supposed to be. It's only an illusion. Oh, yes, the dress isn't Jane's. It's Pat's. Nixon that is. 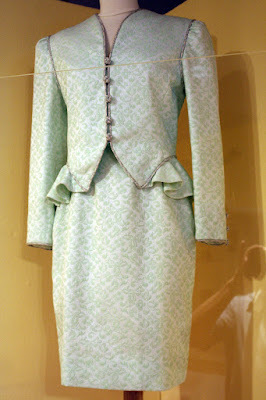 Heck, Jane probably wore something like it at some time in her life. 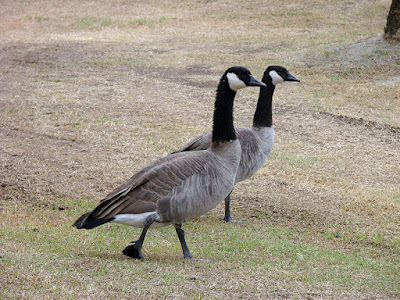 Of course, you know every picture on this blog I took. Here's some of the headlines announcing Jane Wyman's left. She died in Palm Springs. 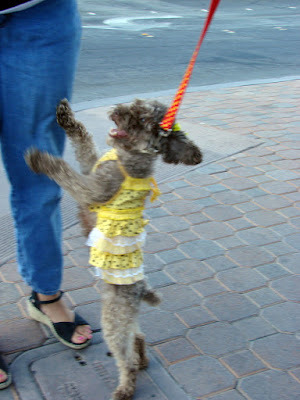 Sometimes they call Palm Springs "Poodle Springs." Here's why. The desert can come up with some very strange bugs at night. 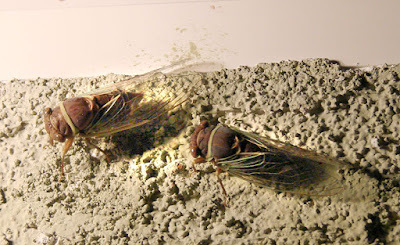 This pair of beasts were hanging at my house the other night. 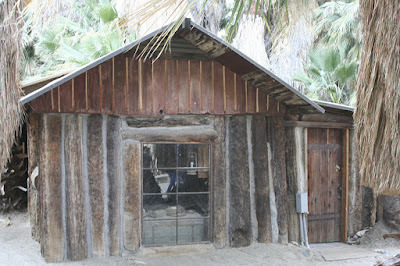 Wood shack at oasis near Thousand Palms. Desmonds, a men's store on Palm Canyon, had been open since the 1930s. 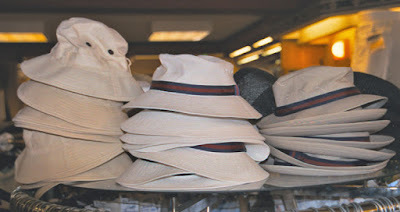 Above are some hats that were sold in the store. It closed a few years ago, like so many other stores have. 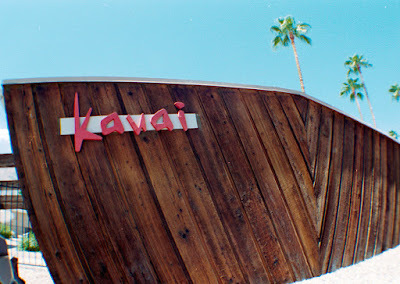 Great fish eye's view of the Kauai, another stylized apartment building in Warm Sands. 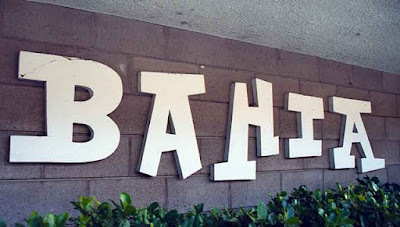 Love those apartment building signs. Any guesses? 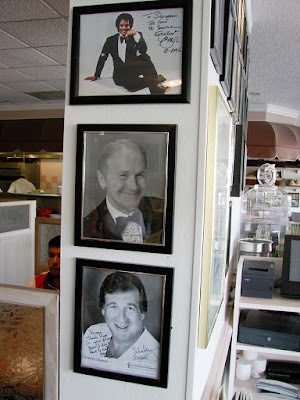 They are hanging up on the wall at Sherman's.